Perrier is the best known sparkling mineral water in the world. The iconic French product was introduced to the global market by an Englishman, St John Harmsworth. William Albert St John Harmsworth (1876 – 1933) was the son of an unsuccessful alcoholic London barrister and a strong-willed mother. Slight and nervous as a boy, Harmsworth attended Henley House School at St John’s Wood, London. There he was a pupil of H G Wells (1866 – 1946), later the author of The Time Machine (1895) and The War of the Worlds (1898). Harmsworth was not the most academically-minded of pupils according to Wells, but he did grow to be charming, likeable, athletic and handsome. Harmsworth followed his education with work as a director at Amalgamated Press, a newspaper empire created by his elder brother Alfred (1865 – 1922), which included the Daily Mail, the highest-selling newspaper in the world. His brother suggested that Harmsworth travel to France in order to learn the language in 1902. Harmsworth visited a carbonated spring at Les Bouillens, Vergeze, in the South of France, where Dr Louis Eugene Perrier operated a commercial spa. Perrier also bottled a small amount of the water for his guests and some local sales. Harmsworth believed in the potential for the bottled water, which was lighter, crisper and had a lower sodium content than most waters sold on the British market at the time. To the horror of his family he sold his shares in Amalgamated Press in order to acquire the Les Bouillens estate in early 1903. Harmsworth closed down the spa, which catered to a declining market, and began to distribute the bottled water, which he branded as Perrier. It was sold at Monte Carlo and throughout the South of France during the 1903 season. Following this successful trial, a London office was established at 45 and 46 New Bond Street by July 1904. The water targeted the premium segment of the market, and was sold at the Savoy, Claridge’s and the Berkeley hotels, as well as classic City of London pubs and restaurants such as Ye Olde Cheshire Cheese and Slaters. Perrier was advertised as an ideal mixer for whisky. Sir Thomas Lipton (1846 – 1931), a friend of Harmsworth, introduced the water to King Edward VII, who granted it a Royal Warrant in 1904. The market for imported European sparkling water in Britain had been well-established by Apollinaris of Germany since the 1870s. Harmsworth packaged his water in a distinctive bulbous green bottle, inspired by an Indian club used for exercises. French culture was considered aspirational, and the water may have benefited from an assumed link with the champagne houses of Perrier-Jouët and Laurent-Perrier, to which it had no affiliation. Perhaps to encourage the association, the water was originally marketed with “the champagne of table waters” slogan. The London office was relocated to 45 and 47 Wigmore Street in November 1905. Harmsworth broke his spine in a tragic motor accident in 1906. Paralysed from the waist down, he channelled his energies into developing the mineral water business. A keen sportsman, Harmsworth was able to maintain his interest in swimming, and had a pool installed at his London address of 7 Hyde Park Terrace. United States sales were pursued from 1907. Perrier was registered as a private limited company to acquire the share capital of La Compagnie de la Source Perrier in 1908. A glassworks was established in Vergeze in 1912. Perrier was granted a Royal Warrant from King George V in 1911. Millions of bottles were sold every year by 1912. Perrier was a well-established rival to Apollinaris by 1914. Perrier was able to gain market share from Apollinaris during the First World War by using advertisements to highlight the German origins of its competitor. During the First World War, much of production was distributed to the Allied armies in France, Salonika and Egypt. Harmsworth negotiated a contract to be the exclusive supplier of bottled water to the restaurant cars of Wagons-Lits in France and Germany in 1927. The London office had been relocated to Bear Wharf, 27 Bankside by 1931. By 1933 Harmsworth had a small stake in the French company, the Compagnie de la Source Perrier, and a large holding in the English company Perrier Limited, which held the British distribution rights. 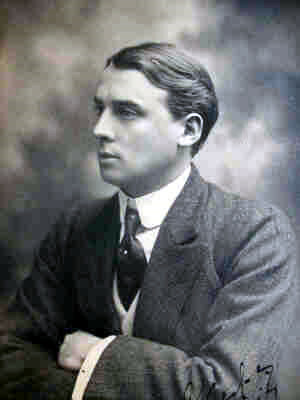 Harmsworth died in 1933 and left an estate valued at £82,976. His estate was left to his brother Vyvyan George Harmsworth (1881 – 1957) and his three sisters. Perrier Ltd had an authorised capital of £110,000 in 1935. The directors were Vyvyan Harmsworth, M Harmsworth and H Banks, who had been secretary to St John Harmsworth. Perrier had never been hugely profitable, and the rest of the family lacked the faith in the brand that Harmsworth had. The family had granted the Britain and Ireland distribution rights for Perrier to Apollinaris by May 1939. The Germans invaded France in 1940, and company capital was transferred to the United States to disguise the British origins of the firm. The Second World War isolated Perrier from its traditional markets of the British Empire, the USA and the French colonies. Sales to the German army represented 40 percent of turnover between 1941 and 1944. After the liberation of France, the Harmsworth family looked to sell the business, which was loss-making and required substantial investment. 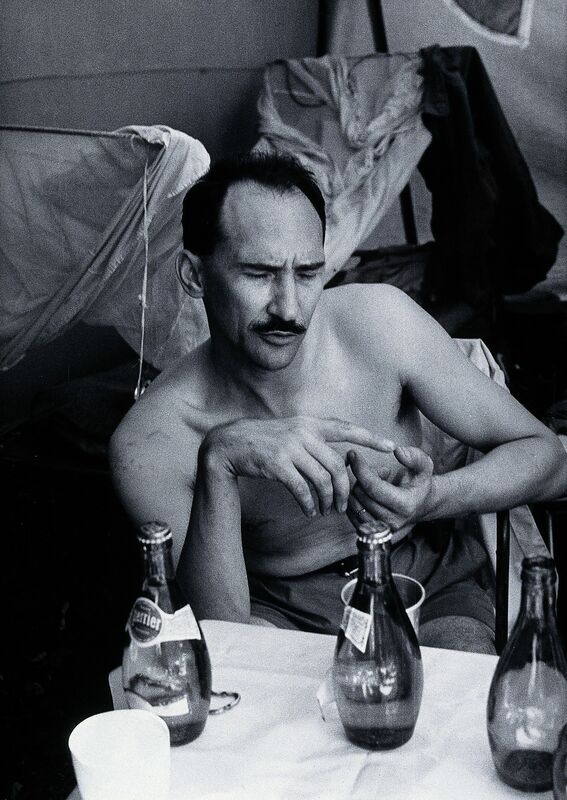 Gustave Leven (1915 – 2008) was working at his family stockbroking firm in Paris when his father asked him to find a buyer for Perrier in 1946. He visited the bottling plant, which was in need of reorganisation. He witnessed workers fill bottles by plunging them into the spring by hand, and sometimes using their feet to help put the bottle caps on. Leven identified a strong brand that had considerable scope for improvement, and with four partners acquired the company for £100,000. Ten million bottles were sold in 1946. Annual sales had risen to 150 million bottles by 1952. By introducing mass advertising to a staid industry, Perrier was able to gain considerable market share in France. Perrier was the highest-selling mineral water in France by 1962, with a 25 percent market share. Leven installed a glass bottle manufacturing plant at Vergeze in 1973. Perrier held half of the French bottled water market by the mid 1970s. Perrier was distributed in Britain by Schweppes and Grand Metropolitan by the early 1970s. The British market was limited to a few high-end establishments, as its distributors did not believe that there was a significant demand for bottled water. Perrier entered into British supermarket distribution for itself from 1974. Six million bottles were sold in Britain in 1978. To further increase sales, Leven turned to the underdeveloped United States market. Three million bottles were sold there in 1976; this had risen to 200 million by 1979. In Britain and the United States, Perrier tapped into a growing aspirational culture, and an increasing health and fitness movement. Rising sales in the United States saw a second factory opened at Vergeze in 1978. The new factory had an annual production capacity of nearly 400 million bottles, adding to the existing factory’s capacity of 350 million bottles. The Vergeze site employed 2,500 people by 1983 and Perrier was sold in 119 countries. 25 percent of sales were in the United States by 1984. 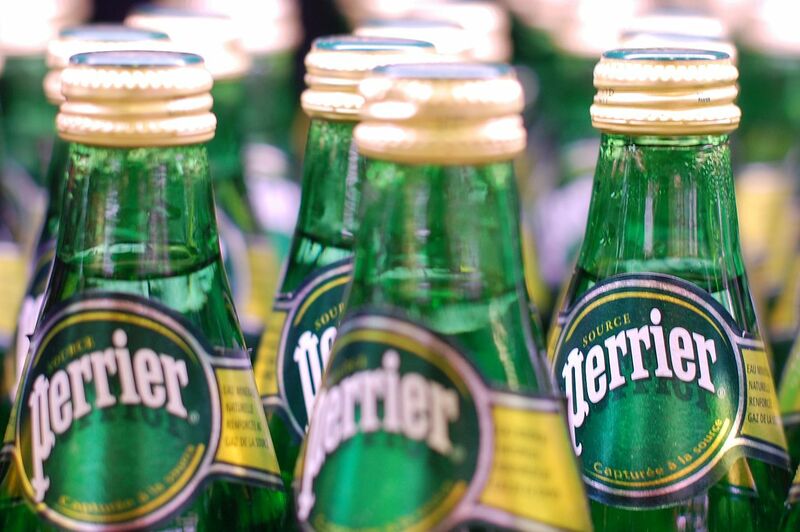 Perrier held 60 percent of the British bottled water market by 1988. Nearly 100 million bottles a year were sold in the UK by 1990. The brand peaked in 1989, when 1.2 billion bottles were sold, with half exported to the United States. In March 1990 it was reported that Perrier contained a minimal amount of a carcinogen, because a filter meant to catch naturally occurring benzene from the spring had not been changed. 160 million bottles had to be recalled from 120 countries, for which the company was not insured. A cancer specialist stated that an individual would have to consume a quart of Perrier every day for an entire lifetime to consume a harmful amount of benzene, but Leven decided that a total product recall was essential to preserve the reputation of the brand. Despite the expedient and responsible reaction of Leven, production levels dropped by one third in the wake of the scandal. A few months later, Leven stepped down as company chairman. Nestle acquired Perrier in 1992, in a deal which valued the company at £1.4 billion (US$2.7 billion). Nestle believed it could turn around the struggling company. Perrier acquired San Pellegrino, its Italian rival, in 1997. Nestle struggled against a powerful union at the Perrier plant. With rising sales, Leven had acquiesced to union requests throughout the 1980s. Faced with stagnant sales, Nestle found that it was unable to continue to accommodate union demands. Nestle failed to make a profit from Perrier between 1992 and 2004. Production levels crossed the one billion bottle threshold again in 2013. 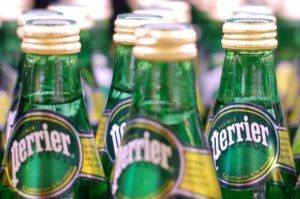 According to data from Euromonitor, Perrier held six percent of the global carbonated bottled water market by value in 2016, and its share is growing. Nestle installed a new production line at the Perrier plant in 2017. It plans to add three more lines by 2020, bringing the total to 15.